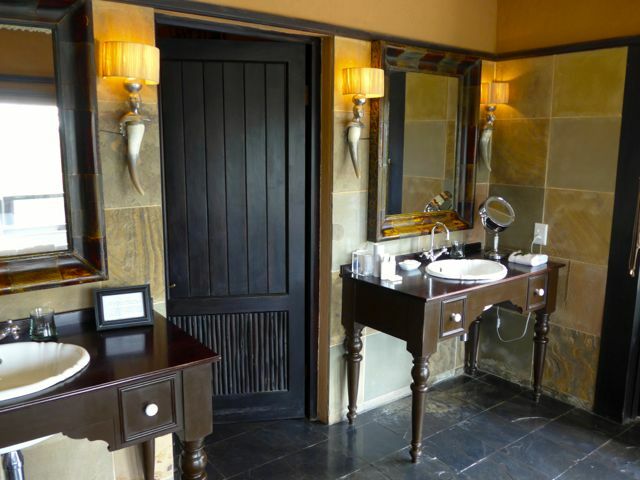 After a brief five minute or so drive in our Land Rover from the airport, we arrived at the hotel, Singita Ebony. 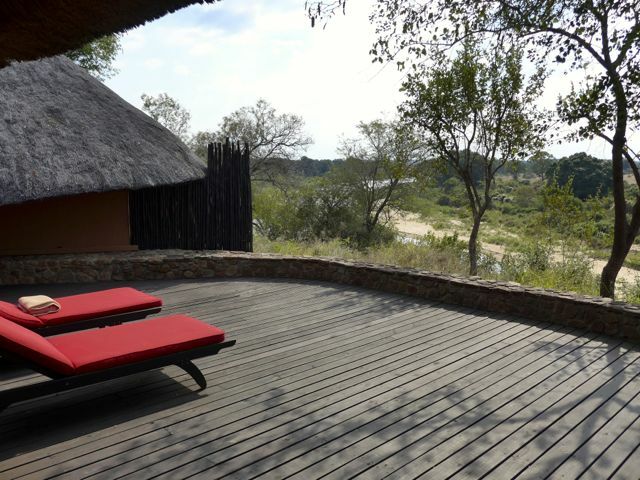 Singita Boulders, a few minutes away, was closed for a month of renovations. 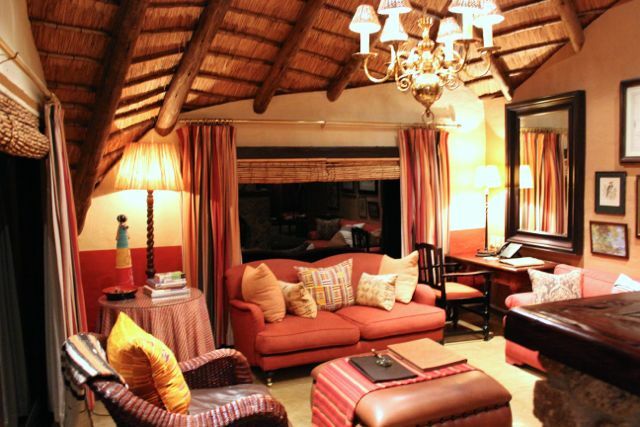 There were just 12 suites on the property, I believe 10 one-bedroom suites and 2 two-bedroom suites. The photo up top and the second photo are the lobby of the hotel in daytime and nighttime. 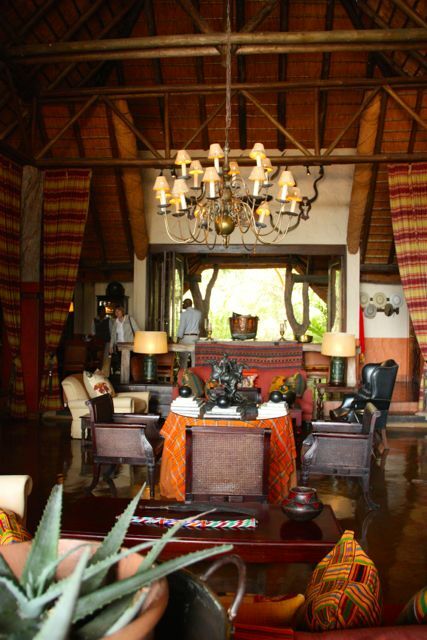 The central lobby or living room was the place to gather for tea, drinks, meet your guides for the morning or evening drives, head to the small cozy library, bar, wine cellar, dining room and outdoor deck for breakfast or lunch. 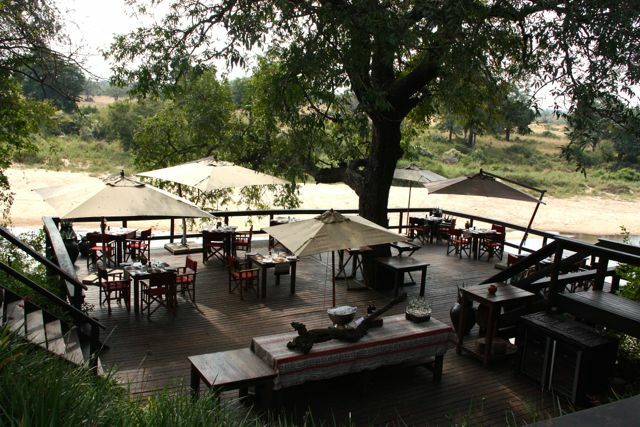 We had several wonderful meals on this outdoor deck, and I will do separate posts on the food for anyone interested in that part of the experience. 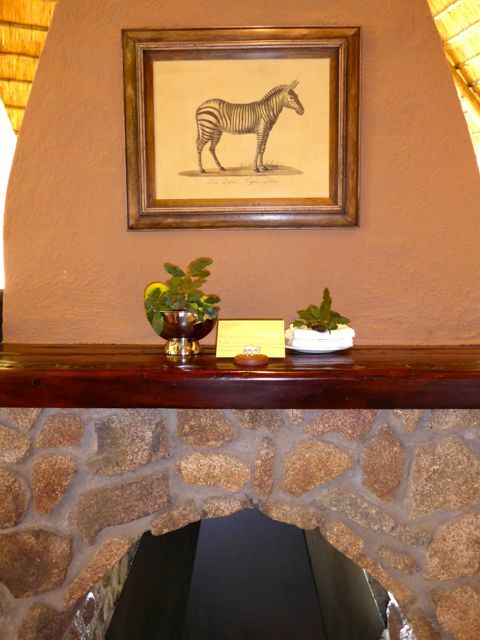 …a personalized note and a bowl of fruit on the mantle of our own stone fireplace. 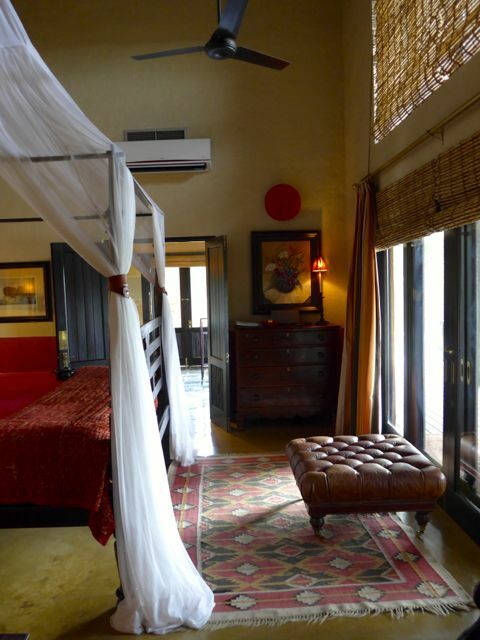 A cozy living room with couches and armchairs upholstered in warm toned fabrics and strewn with pillows, local wraps, handicrafts, books, lamps, hides, horns and artwork. 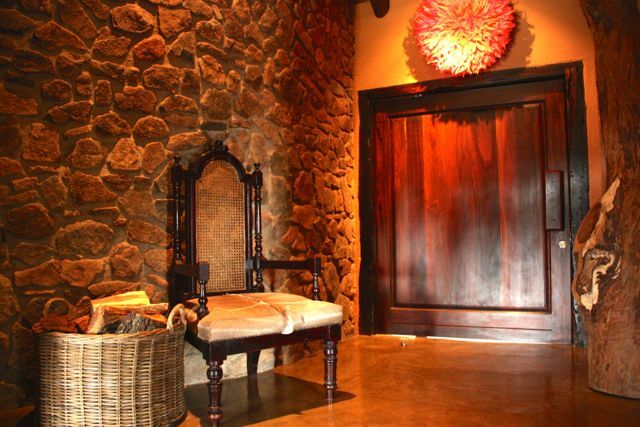 A full view of the fireplace from the living room couch towards the foyer and the entrance to the master bedroom. 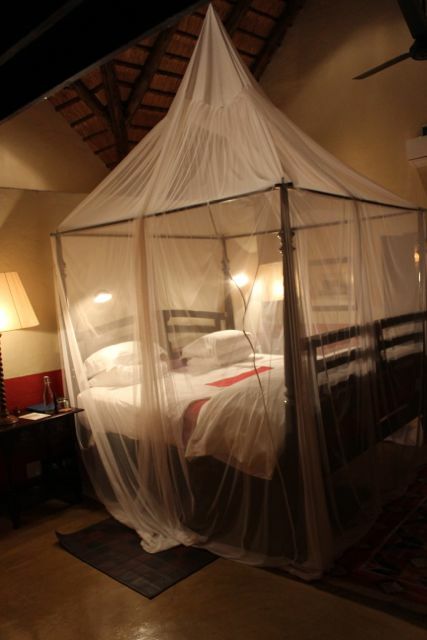 The bed at night, with heated blankets if desired (dual control in case only one of you is cold) and lamps inside the mosquito netting. 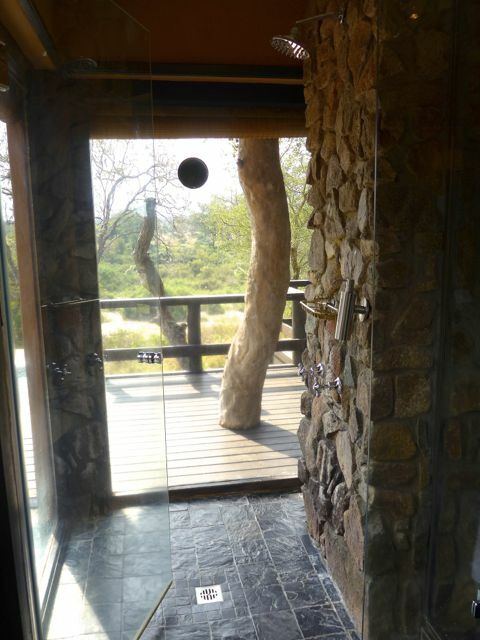 …and my favorite, a corner glassed-in shower for the inner exhibitionist in you. 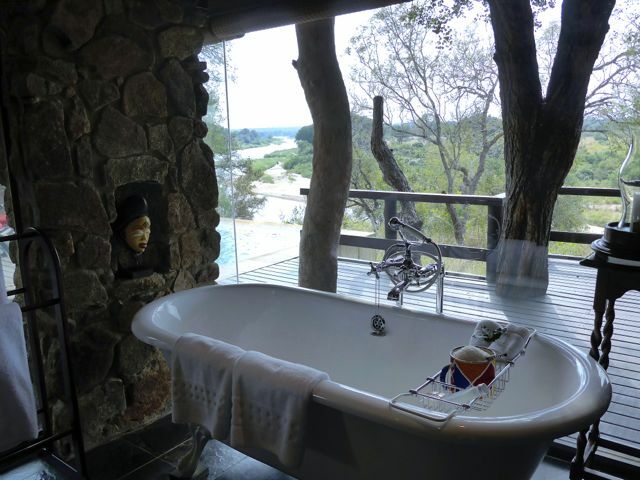 The elephants and leopards across the way would have had a pretty good view of MM in the buff if that was their thing. We never drew down the blinds and it was a wonderful experience to see everything outdoors while you showered. At night, you just hoped you looked better than you really did with all the soft yellow lighting and strategically angled shadows… hahaha. 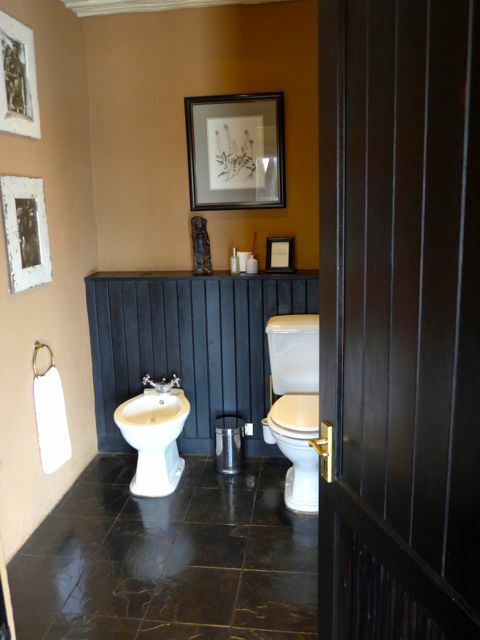 …and her bathroom (literally bathroom, as there was no shower). She was creeped out by the thought of showering in our glassed in shower. 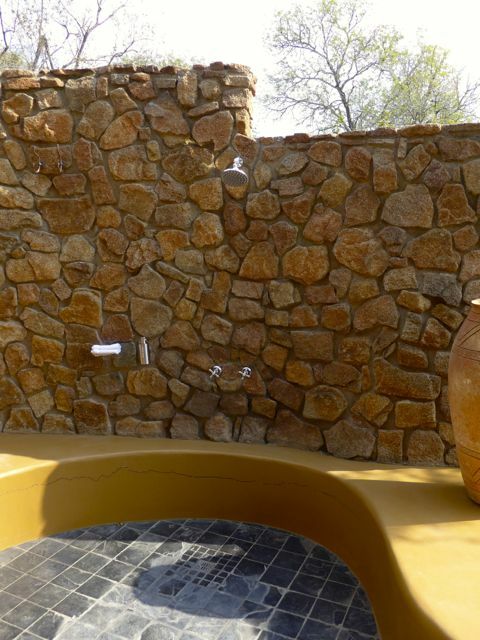 We had a private plunge pool, and the water was HEATED to a very pleasant temperature. 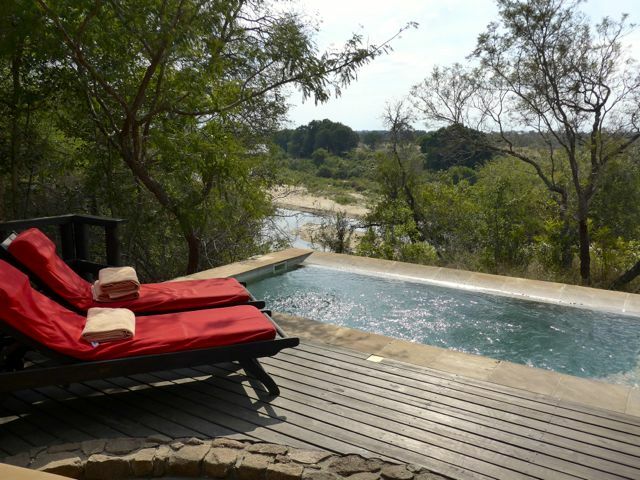 So even when the air temperature was 15C, you could take a wonderful dip in the pool after a morning drive in the bush. 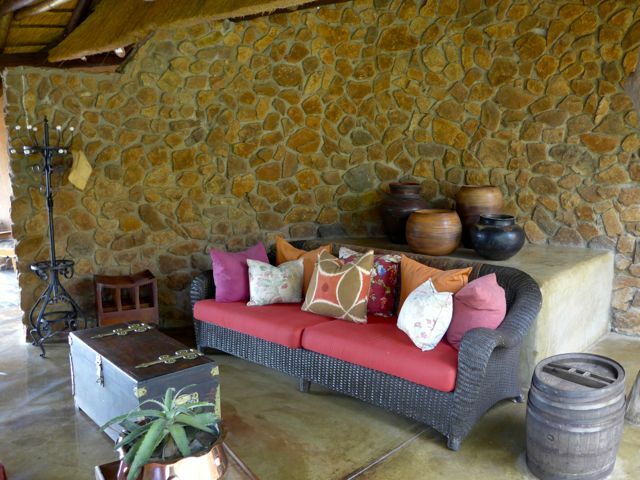 Outdoor chairs and a table to enjoy your tea or to sit and read a book. 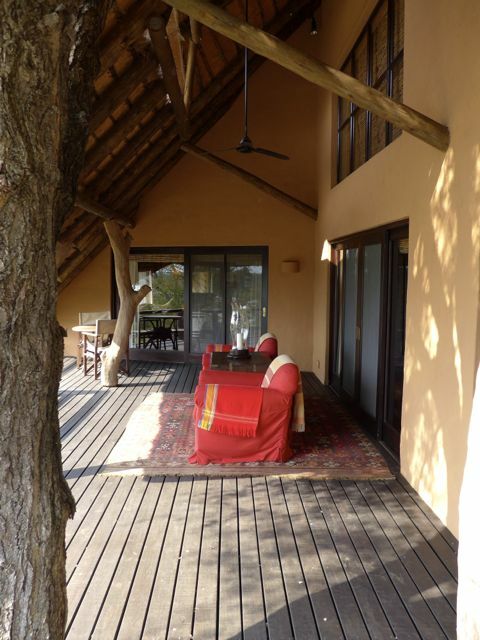 And Villa 1 and Villa 2 (another two-bedroom villa) shared a huge living, dining and deck in between. But our neighbors never used this area so we had it all to ourselves in the brief periods we weren’t doing something else. …and the dining room. Every morning, instead of heading to the main lodge on foot, our porter and the butler set up a light breakfast buffet in our dining room so that we could grab a bite to eat and a hot tea then we were escorted to our Land Rover just meters away and went straight onto our morning game drive. So civilized. 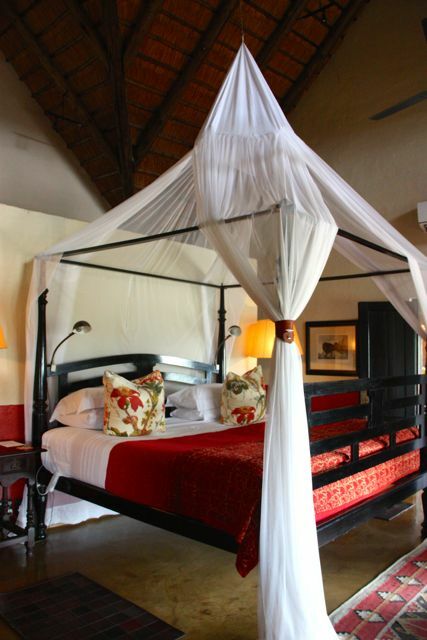 For more information on Singita, visit their wonderful website, here. And for those readers unfamiliar with Marketman, let me make it crystal clear that this post and the posts that follow on our trip to South Africa are in NO WAY SPONSORED posts. Mrs. MM and I paid for everything out of our own pockets, we planned our itinerary with the help of Asia to Africa Safaris (more on them later), booked our commercial SQ flights and paid for them, and I don’t think any of the people we met or hotels we stayed in had any clue that I even had a food blog at all. So everything you will read here is our personal unbiased opinion of the experiences we had. Wow, Mr. MM. I agree with you that that is one of the best hotels you’ve ever stayed in just from looking at the wonderful pictures alone. 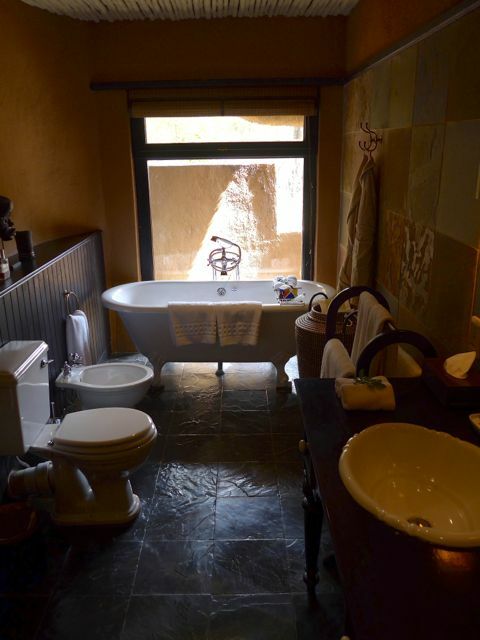 My personal favorites are the bathtub overlooking the scenery outside (photo #14), the corner glassed-in shower, and the expansive deck with the view of the river. Looking forward to your posts of the wonderful meals and food you’ve had on the outdoor deck. This whole adventure is so inspirational. I too will endeavour to do an SA safari. Seems like a better choice than the tree house type in Kenya. I’m so excited to read all your forthcoming posts. 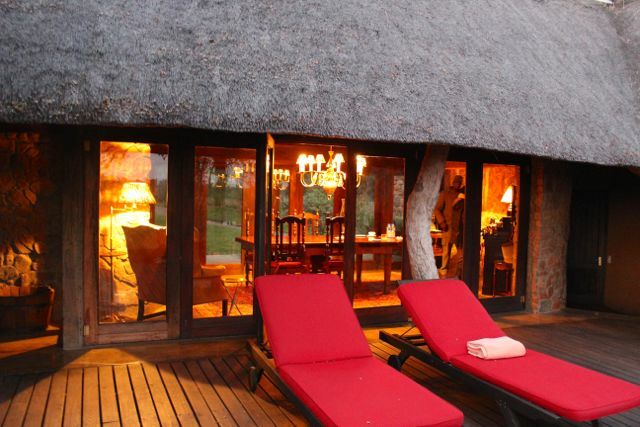 An African safari travel adventure did not even make it to my bucket list but you are absolutely changing that. Thank you for sharing. My daughter Celeste went backpacking in Africa with a tent and sleeping bag and caught malaria really bad despite taking recommended anti malaria tablets from Australia. She also got sick in other ways, but did stay nearly a year until illness forced the end of her travels. What a cozy accommodation you have. Glad to know that your joint 100th birthday celebration turned out great. Can’t wait for your other posts! wow! as in wow! looking forward to more posts. God willing, bka mapadpad ako sa lugar na yan! tnx a lot MM! My favorite is the plunge pool and the expansive lanai. 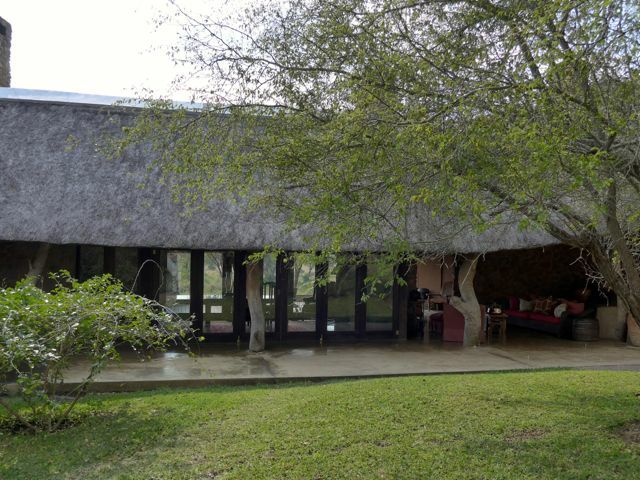 I like that they used native materials for the roof. What do you mean “for those interested in the food part of the experience?” I come here mostly for the food, the guessing games and clever informative comments. The billowy swaggy mosquito nettings are just touching lagniappes. This post sounds so… so… foreign to me. All your posts used to be that way, but I guess I got used to the unpronounceable ingredients mixed with some very familiar ones. 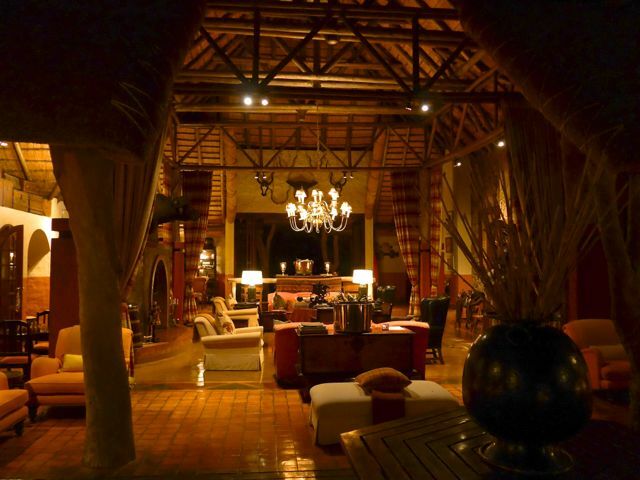 But this very… very… touristy trip to a fancy resort in Africa seems too strange. Until the last paragraph when you do sound very much like yourself. I still don’t understand what the attraction was and would love to find out in the next posts. @Khew, I was going to say the same thing about “I will do separate posts on the food for anyone interested in that part of the experience” –> MM, you are such a tease! Haha! On a serious note, I am so loving this series almost as much as your Euro tour ones – and this is only the second post! Looking forward to the next ones. I am now utterly convinced that going into the bush will be a fitting birthday present to myself – hopefully, while I am young and spry enough to run with the gazelles. Harhar! I would make a wild guess that there was some exotic but not endangered meat or produce in your meals. 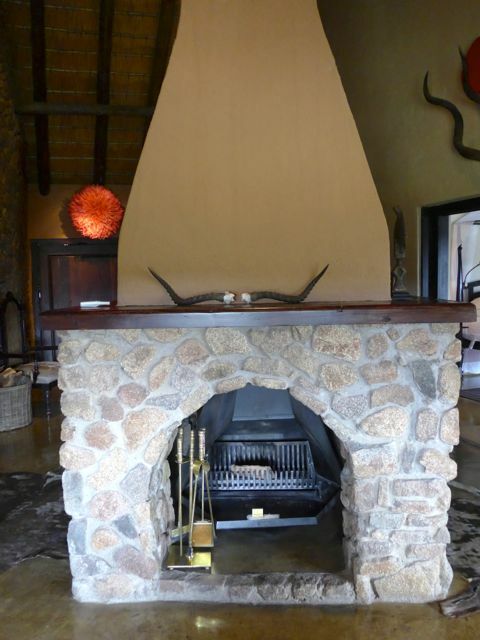 I hope you were able to enjoy some boerewors and biltong during your stay!? Khew, you meant ZA (South Africa) not SA (Saudi Arabia), right? 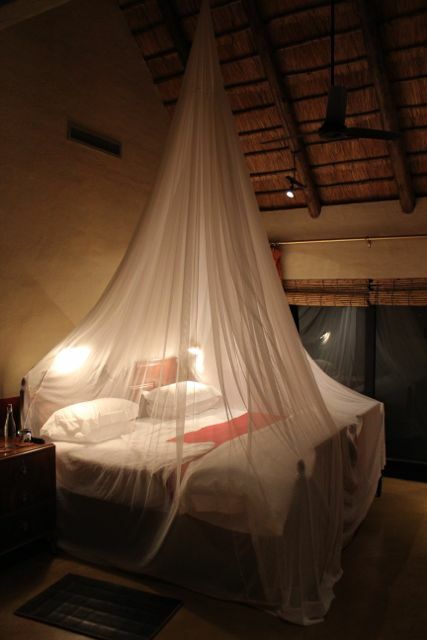 If I ever do a Safari trip, like MM,I will get the best and safest accomodation and Safari tour however this is not in my bucket list as I am not comfortable with small planes and wildlife close encounters sans the bars! 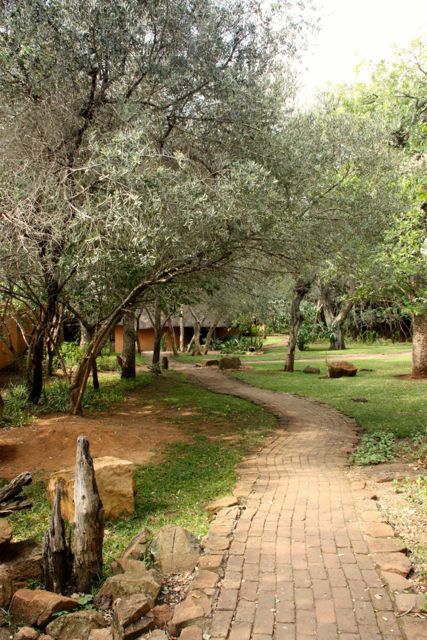 :) Thus,I will just “live” the experience thru MM’s detailed Safari posts! Yes, you’re right Connie. :) I was literally abbreviating. ZA it sure is – Zuid-Afrika. Gorgeous!! Of course I’m interested in the food but I definitely want to hear everything! It does sound incredibly awesome and what better occasion for a splurge than a joint 100th birthday (all the best to both of you)! Can’t wait to read more! :) Although I know that 200 meter walk would have freaked me out every time, heehee. Sigh…I am bookmarking this for my vacation inspiration board! I agree with Betchay. African Safari is not on my bucket list. I will just have to live vicariously through your posts and pictures, MM. It seems like a wonderful experience. Maybe someday I will change my mind but, for now I will just enjoy looking at the pictures. MM, your disclaimer at the end of this post is one of the reasons why there are a lot of followers like me who continue reading your blog through the years. Since you are not bound by some consideration or gratitude when you write about a certain place or restaurant, what we get is an honest, unbiased and/or objective view. Thank you. Hi MM! Glad to know you enjoyed Ebony as much as my family. 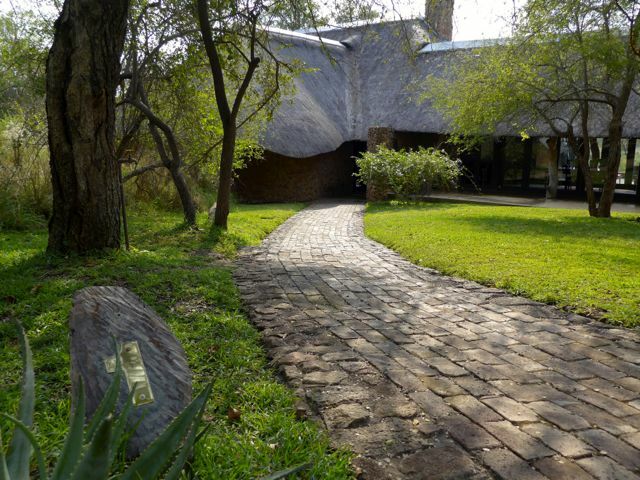 We visited the lodge in 2012 flying from JNB to Nelspruit and driving for two hours to the lodge. We could not part with our trolleys. I miss the Oxtail Potjiekos/Pap/Chakalaka which we had during the African Braai dinner and the Cap Classique for Breakfast. I still have the mosquito repellant wipes. Hope you bonded well with your ranger. why all of a sudden it feels like i am watching again the movie “Out of Africa”…can’t wait to read the other posts…thanks again!